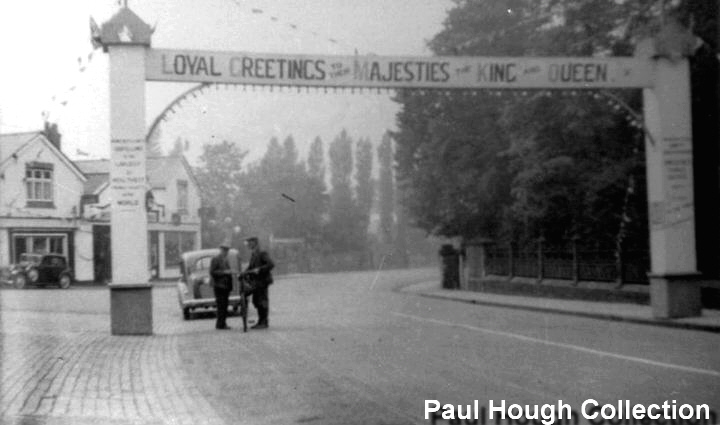 On the 12th May 1937 Middlewich joined with the rest of the country in celebrating the Coronation of King George VI, and we assume that this picture was taken, if not on the day itself, on a day very close to it.. The Coronation marked the end of a turbulent time for the British Monarchy. Edward VIII had reigned for less than a year before he was forced to abdicate rather than give up his relationship with Mrs Simpson. He was never crowned and by 1937, when Edward had been succeeded by George VI, the Monarchy was keen to mount an occasion to remember, in order to restore Royalty's somewhat tarnished reputation. The town rose to the occasion, as it traditionally did when it came to Royal occasions. Middlewich had always considered itself to be a 'Royalist' town, from the days of the civil war, although by 1937 this will have been more a matter of custom and practice than of any deep-seated emotional attachment to the Crown. Nevertheless, for the 1937 Coronation, Middlewich pulled out all the stops. Among the many events were no less than three processions through the town, a bonfire and firework display, and sports on the football ground in Seddon Street. All these things, and more, were recorded on film for posterity by members of the Mid-Cheshire Amateur Cinematography Society (MCACS) and the films subsequently shown to the public in the Alhambra Cinema. The Coronation 1937 film is now preserved in the North-West Film Archive at Manchester University, as part of the Roberts Collection. The film, with the original opening titles restored, can be seen on the Salt Town Productions YouTube channel. Please follow this link. Another feature of Middlewich's celebrations for this momentous Royal occasion was the erection of arches bearing patriotic messages across some of the streets. a quote which is attributed to Charles Frederick Lawrence, Clerk to the MUDC, historian and poet. And eke a bowling alley. In the background Middlewich Motors can be seen, draped with bunting for the occasion, and with another of those superb vintage cars parked outside, complete with spare wheel carrier. Under the arch itself a gentleman who looks very much like a postman is passing the time of day with a local resident.